Join us this year as we hike into New Mexico's historic past! 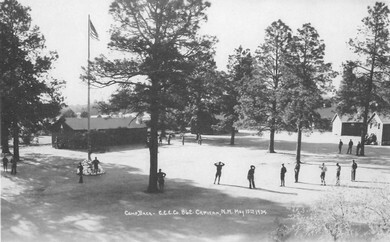 Between 1933 and 1942, a 20-acre site in southeastern New Mexico, now known as Baca Campground, developed over three occupational periods. First was the constuction and occupation of the Civilian Conservation Corps (CCC) Camp Saturnino Baca, DF-17-N. The camp was condemned for winter use by the U.S. Forest Service, so it was abandoned after only one summer, during 1934. The camp buildings then sat unoccupied until 1935, when it was discovered by the National Youth Administration, and used to creat one of the nation's first Unemployed Girls Education Camps. The camp was occupied year-round from then until 1940 when, once again, the camp was abandoned. It was turned into a concentration camp after the bombing of Pearl Harbor on Dec. 7, 1941, after which Japanese railroad workers for the Atchison-Topeka, and Santa Fe rail lines, living in Clovis, were run out of town. Two families and a number of single men - a total of 32 individuals - were taken to Camp Baca and detained "for their protection." This project will be a metal-detector survey of Camp Baca, and will be the third and final remote-sensing survey performed at the site. As such, we are looking for volunteers who have metal detectors, want to share their expertise, and are willing to help us put the site :back on the map" and reveal its secrets! Please indicate on your application if you have and know how to use a metal detector - it is the one thing required for participation.